South Tillamook County is a special corner of the coast -- only two hours from Portland, OR, but a world away from everyday cares. The Hudson House is located two and one-half miles south of Cloverdale, OR, and three miles east of Pacific City, OR, and its unspoiled beaches. If your idea of relaxing leans towards quieter pursuits, you can curl up with a good book in your room or the Library. Take a romantic stroll on nearby beaches or stargaze on a balmy summer evening. The more adventuresome may enjoy a hike through towering trees to spectacular views of the coast and migrating birds and whales. Three Capes Scenic Drive transports you past miles of beach, through quaint villages and back in time to a historic lighthouse atop Cape Meares. Hiking - There are many beautiful hikes in the area. Some of the most spectacular trails are on Cascade Head just south of the Hudson House. There are several points from which to start with varying distances and difficulties, but they all have one thing in common -- incredible views of the coast from atop 700 foot high cliffs. Other trails beckon as well. 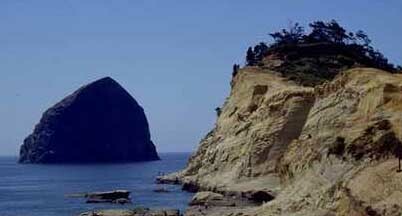 Cape Lookout offers a scenic trail with beatiful views of the Cape and the Pacific. We have discovered a great walk on the back side of the dunes between Nestucca Bay and the Ocean starting from Bob Straub State Park, returning via the beach. Further afield, Tillamook Head (Nowhere near Tillamook, but between Seaside and Cannon Beach) has several trails following the footsteps of Lewis and Clark as they explored from their winter headquarters at Fort Clatsop. Nea-Kah-Nie Mountain rewards you with some the best views of the coast you will ever see. Fishing - Fishing, crabbing and clamming are major attractions in our area. We can put you in touch with guides who can lead you to the best waters for each of these activities. Kayaking - Kayak rentals are available from Riverside Kayak Company and at Village Merchants. It's a wonderful way to experience the wildlife and the beauty of the Nestucca River and the Bay and the other estuaries in the area. Cycling - Cyclists will find miles of beauty along South Tillamook County roads. Rides vary from easy flat terrain to hills that will torture your quads. Whale watching - The great gray whales head down the coast on the way to their calving grounds in Scammons Lagoon in Baja California in late December and into February. The whales begin their northward return in March. Whale watching boat trips are available from several ports, but whale can also be spotted from many headlands and capes in Tillamook County. Hudson House guests have reported whale sightings at all times of the year. Volunteers are posted at multiple locations to help you spot the migrating whales during key migration times. Storm watching - Winter storms can be very exciting. Check the Weather Channel or your local news program for the big ones. The sight of huge waves crashing on a rocky shore can be amazing. Beachcombing expeditions can be rewarding after a storm. Use caution, though. Observe the action from a safe distance where you won't be caught by the big waves. Also ask us about "Sneaker" waves. Birding - The Nestucca Bay National Wildlife Refuge is just around the corner. Rafts of ducks, geese, and other birds congregate on the flooded pastures. Ocean Bay Spit at Tillamook Bay is another fine bird watching area. Golf - There are plenty of excellent nine and eighteen hole public courses in the area. Antique shopping - Lincoln City and Newport boast many antique shops. Factory Outlets Stores - Most of us get our fill of the shopping at the local mall, but the outlet stores in Lincoln City and McMinnville are worth the trip. Cheese Making - The Tillamook Cheese factory is worth a stop if you've never been there. Take a tour and visit the gift shop. Museums - The Tillamook County Pioneer Museum tells the story of Tillamook County, from the Native Americans and early settlers to today. The Naval Air Museum in Tillamook is a must stop for aviation fans interested in WWII aircraft.